About the Toon: She was the first! So there’s a lot to say about her. And I guess she’s my main, as I’ve yet to get anyone else to the cap, which as of this writing, stands at 75. It’s also why I use her handle as my own, seeing as I want to be able to be associated with her when I’m running around in game. Bel was the first toon who started to have a story, and that’s rather important. What else, what else…well, she’s a hunter. Point and shoot, do not aim directly at face, etc. I enjoy DPSing, it’s nice and simple and keeps my obligations to a minimum. Beldrieth’s appearance (by which I mean her hair) has probably changed the most of all my toons, before I settled into the vogue of keeping it the same. And it’s short! Short and blonde. Would not have expected it, but the practicality of it appeals to me. It’s actually not the hair seen in the picture, it’s another style which is far more typical of Bel. On that note, It’s also been dreadfully hard to fix myself on a single iconic outfit for her. I need something that looks particularly elven, but also very practical, and I haven’t settled on anything quite yet. What’s pictured here was really a one time thing, Bel really doesn’t wear dresses that often. Nothing seems quite understated enough for what I consider her needs. But this is all more worthy of discussion in terms of her character. About the Character: I suppose the biggest definition of Bel’s personality, for me, is just how serious she seemed when I rolled her. If she’d been a cheerful looking elf, things probably would have been different. In fact, I rolled a cheerful looking elf, and he’s Celebarad, and he is different. So, she’s quite serious. Other than that, for the moment at least, I’m keeping it fairly ambiguous. It’s difficult to put too much down about Bel, because elves being what they are, and me being rather lazy in my research, I don’t want to pin anything down, only to have it revealed to be completely untenable with respect to the lore. Here’s what I will say. She was under the command of Celebarad’s father during said war. All that being said, what I want to emphasize about Bel is that she’s not particularly special. Not remarkable, anyway. Brassica’s the remarkable one, going out and defying hobbit conventions. Beldrieth is just an elf who’s been rattling around the world for a long time. She has a story, but it’s a common and unremarkable one. She wasn’t the best hunter in Lorien, she’s not Celeborn’s secret daughter, she wasn’t trained by Gil-Galad or Celebrimbor or any of the other nonsense you sometimes see other people clutter up their character bios with. (Which is an awful thing for me to say about people and whatever they choose to write about their toons, being that I have no small preoccupation with writing about mine, and I’m audacious enough to believe other people should be interested. I just think that its important for a character’s backstory to be extremely grounded with respect to the game.) When I get around to telling her story–and I will, because it’s been percolating in my head for a long time, and has already had its groundwork laid out–I want the important thing about it to be that it could just be a little story, that got lost in the sweep and scale of Tolkien’s vision. 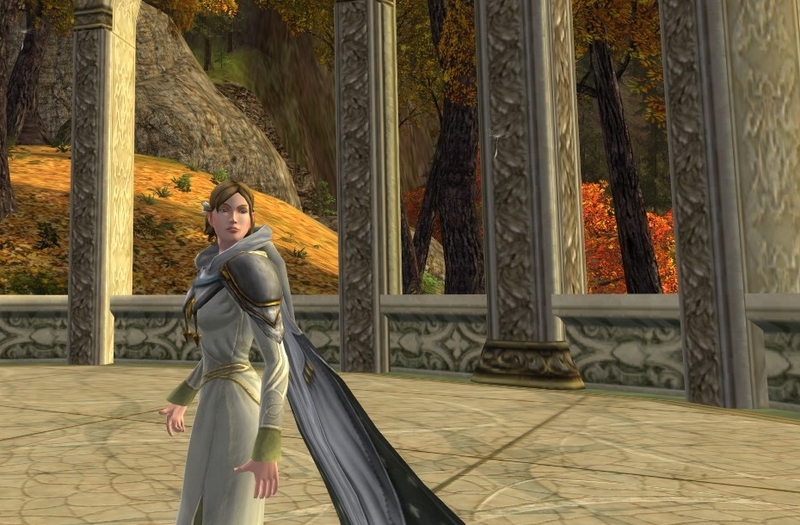 Welcome to My LotRO blog!